From the man who brought us Grizzly Man and Fitzcarldo brings us the story of one man's survival in a jungle few have been to. Any time a movie directed by Werner Herzog is talked about it goes without saying that the conversation will always steer itself to talk about Herzog and the movie will become a second topic. For a director to have his movie overlooked because of who the director is can usually come about two ways. The first being that he is a world class director who is seen in the highest of lights. Steven Spielberg, Akira Kurosawa, Martin Scorsese, and Quentin Taratino are just a small sampling of directors who are held in the highest regards. Then there are the directors who are known for being a bit crazy. Stanley Kubrick, James Cameron, Terry Gilliam, and Alfred Hitchcock are all known for their antics on the set. Werner Herzog is one of the few who can show up on both lists. Herzog is known for his feud with his long time lead actor Klaus Kinski. Watch the movie Fitzcarldo and the watch the documentary Burden of Dreams to see what I am talking about. Herzog is a master filmmaker, but he is a bit crazy as well. In his movie Bad Lieutenant: Port of Call: New Orleans (and yes you read that correctly, the movie as two subtitles), Nicolas Cage has a guy shoot another guy, then tells him to shoot him again. When the man asks why because the man is clearly dead, Cage responds that the man's soul is still dancing. The camera then pans over to where the body is, only now where see a man break dancing. It is a genius scene, but it is also incredibly crazy. This is the type of director Herzog is. You question what he puts in his movie, but in the end the decisions he makes actually make sense. Herzog deals more in documentaries than movies. For every one movie you see on his IMDB page, you will see four or five documentaries. I think that he finds real life more interesting than a movie world, even if the movie is based on a true story. Herzog has made the heartbreaking Grizzly Man and introspective Into the Abyss. Roger Ebert, who was a huge fan of Herzog and was planning on writing a book on Herzog before his untimely death in 2013. wrote that Herzog always knew where to point the camera. I know that sounds kind of stupid, but just think about all the videos we see on YouTube and then think about how many times we yell at the screen, telling the people who are recording to turn the camera and look elsewhere because that is where the action is. Think about how many video are some person recording one thing while something else is going on. We can hear it but the person who is making the video just won't turn the camera until it is too late. Herzog would have turned the camera and gotten everything. Now I guess I should talk about Rescue Dawn because that is why you are reading this. 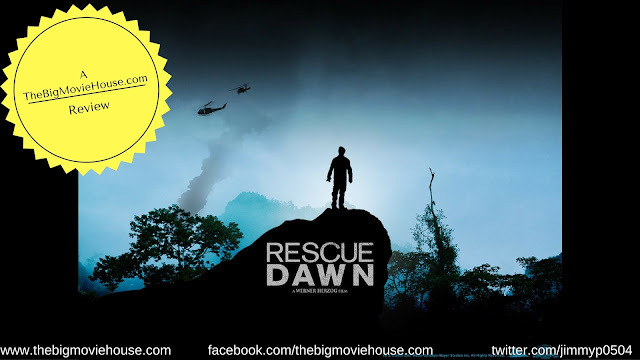 Rescue Dawn is a 2007 movie that tells the story of Dieter Dengler, who is captured by the Vietcong, after his plane is hit by something during a bombing run in Laos. 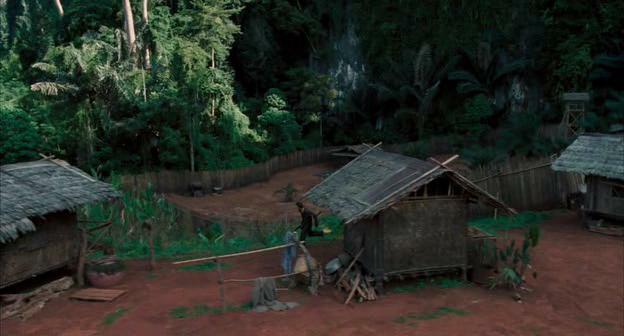 Dengler is taken to a small prison camp in the middle of the jungle where he meets other POWs. He becomes close to an inmate named Duane (played by Steve Zahn) and convinces the other inmates that they need to escape. The group comes up with a plan and set a date, only to have the date moved up after they find out that the prison guards plan on killing them. Up until this point in the movie, I was really intrigued by what was happening. I love prison escape movies and this one was shaping up to be a good one. But then something happened that was not expecting. The movie turns into a movie about survival. I know that you are thinking that I should have known this if not for any better reason that they mention, in the movie no less, that the real prison is the jungle. The prison is just for walls in the middle of nowhere. Compare it to escaping from a prison in the middle of Nevada. There is just desert for as far as the eye can see. The prison is a comfort compared to the desert. Same thing applies here. The jungle is a killer. The prison escape happens about halfway though the movie. The back half is Dengler and Duane trying their best to survive in a land they know nothing about. This portion of the movie is tense and suspenseful. We have as much of an idea of what is around the corner as the characters do. Dengler and Duane do everything they can to survive and find their way to Thailand, but they hit many obstacles. They find a river and make a raft, then come very close to becoming the victim of a waterfall. They carry around a few guns for the majority of the journey, but then decide to ditch them because they would do more harm then good. The journey is hard on them and us as well. Herzog captures all of this with a calmness that doesn't seem like it would work in a movie like this. 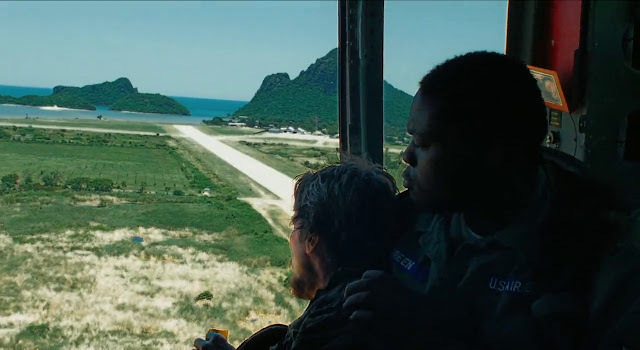 The movie moves at a very deliberate pace, taking its time to make sure that we know where we are before springing something on the characters as well as us. When Dengler is captured he is taken a on very long journey to the prison camp. This is all done on foot. The scenes are scary because we don't know where they are going next. These scenes mirror the scenes after the escape. In both, Dengler knows nothing of where he is going. He just knows that he is being led there. 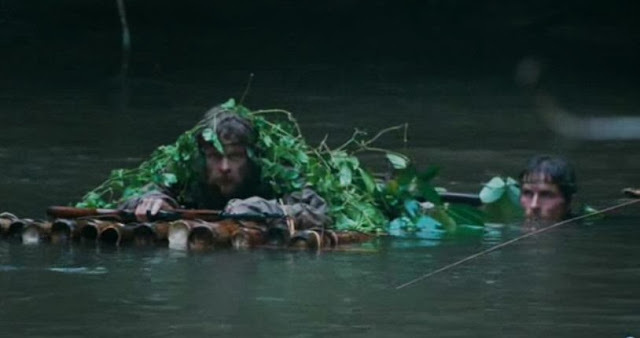 During the survival portion of the movie, Dengler has no idea where he is going but he is being led, not by his captors, but by his will and determination. Evil leads him in and good will lead him out. Herzog is very familiar with this material. Ten years before the release of Rescue Dawn, Herzog made a documentary called Little Deiter Needs to Fly, in which the real Dieter Dengler recounts the events that are told in this movie. It is kind of weird to see a documentary that is so close to the actual person and then see a fictionalized version of that same story. I know that it happens all the time, but it very rare that both movies would be made by the same director. I should probably mention the performances. Christian Bale, who plays Dengler, is great. 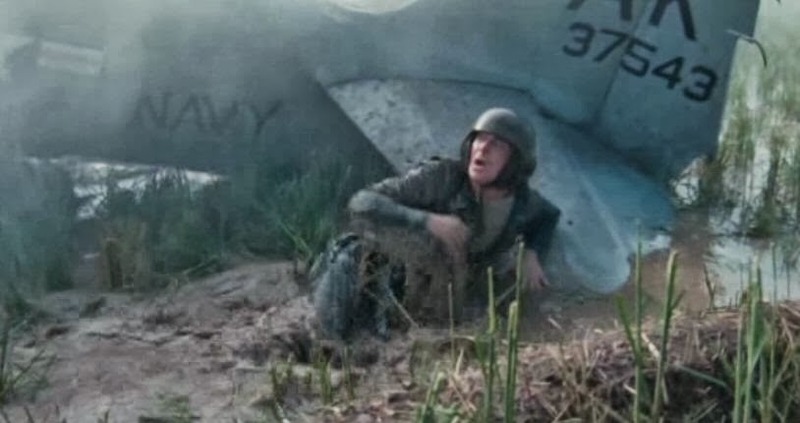 Bale always brings his A game even if the movie doesn't call for it, which Rescue Dawn is not. Dengler is confident and smart, determined and caring. Bale brings all of this and more to a role that a lesser actor would have blown off. The real surprise here, though, is Steve Zahn as Duane. Up to this point is his career, Zahn was known for his comedic roles. He had done a few dramatic roles here and there, but nothing that really stood out. I remember that when it was announced that Zahn would play a role in this movie, there were a lot of people saying that he was completely wrong for the role. I was one of them. I know admit that I was wrong. Zahn perfectly plays a man who is slowly going insane. During the back half of the movie, Zahn has to go through am extreme range of emotions and handles it so well that he should have been nominated for an Oscar. The cinematography is gorgeous. Almost every shot in this movie is something that you could hang on your wall. Everything from a mudslide to a trip down a river is just beautiful. I like that Herzog made the movie so beautiful. It is a complete juxtaposition to what the characters are going through that it gives the movie a completely different level of thought. 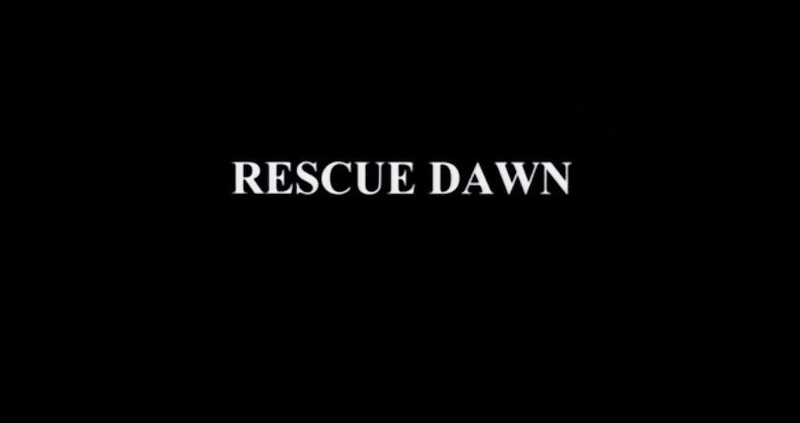 Rescue Dawn is a great movie. Herzog is firing on all cylinders and has made one of the best movies of his career. 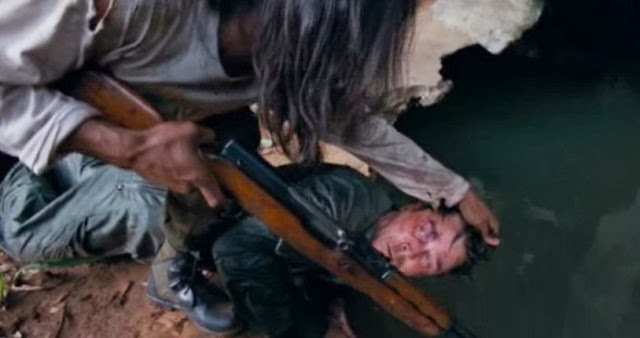 Rescue Dawn was a flop when released in theaters back in 2007, but the movie deserves to be seen and appreciated. Everything works in this movie, which is very rare.